Money purchase plans are similar to profit-sharing plans, but with a profit-sharing plan, the employer can determine each year how much will be distributed to employees. Instead of a fixed percentage of salary, a profit-sharing employer could decide to share a fixed amount of profit and distribute it to employees each year as a percentage of salary. For employers, money purchase plans make budgeting and planning for contributions easier, while profit-sharing plans offer more flexibility in less profitable years. There are limits to how much employees may contribute to a money purchase plan. The limits adjust over time with the cost of living. In 2015, contributions to money purchase plans are capped at 25 percent of the employee's salary or $53,000, whichever is less. 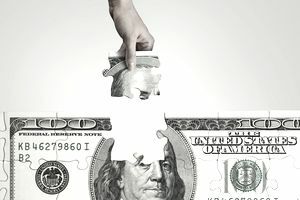 Contributions for highly paid employees can't outweigh the contributions for lower-paid employees by too much in a money purchase plan or other types of qualified retirement plan. The Internal Revenue Service conducts "top-heavy" or nondiscrimination tests to determine whether the plans favor certain employees over others. If a plan is showing favoritism, contribution limits may be reduced for those who are paid most. Some may even pay a penalty for this. The IRS also can punish the company with excise taxes if it fails to fully fund its money purchase plan. Who Can Have Money Purchase Plans? Businesses of any size can offer money purchase plans to employees, and they can be designed very simply or made very complex depending on the company’s needs. All that is required is the employer file an IRS Form 5500 each year. Small companies may consider a pre-packaged money purchase plan from a qualified retirement plan provider who administers the plan on the company’s behalf. Money purchase plans can be offered in combination with other types of retirement plans. In fact, these plans were once commonly paired with profit-sharing plans, which gave companies the benefit of high contribution limits and a degree of flexibility in determining the number of each year's contributions. That was when money purchase plans had some of the highest contribution limits available to employees. In recent years, however, contribution limits have risen significantly for much simpler types of defined contribution plans, removing most of the advantage from the money plan/profit-sharing combination and decreasing the general appeal of money purchase plans for employers. Still, money purchase plans remain appealing to employees and can be a selling point in a competitive hiring market. Companies that have money purchase plans may consider maintaining them for this reason. Employers who want to convert a money purchase plan to another type of plan should pay attention to the strict IRS guidelines for doing so, or retain the help of a professional plan advisor.